The 1989 Loma Prieta earthquake occurred in Northern California on October 17 at 5:04 p.m. local time (1989-10-18 00:04 UTC). The shock was centered in The Forest of Nisene Marks State Park approximately 10 mi (16 km) northeast of Santa Cruz on a section of the San Andreas Fault System and was named for the nearby Loma Prieta Peak in the Santa Cruz Mountains. With an Mw magnitude of 6.9 and a maximum Modified Mercalli intensity of IX (Violent), the shock was responsible for 63 deaths and 3,757 injuries. 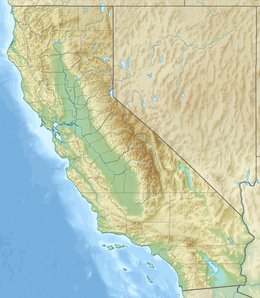 The Loma Prieta segment of the San Andreas Fault System had been relatively inactive since the 1906 San Francisco earthquake (to the degree that it was designated a seismic gap) until two moderate foreshocks occurred in June 1988 and again in August 1989. Damage was heavy in Santa Cruz County and less so to the south in Monterey County, but effects extended well to the north into the San Francisco Bay Area, both on the San Francisco Peninsula and across the bay in Oakland. No surface faulting occurred, though a large number of other ground failures and landslides were present, especially in the Summit area of the Santa Cruz Mountains. Liquefaction was also a significant issue, especially in the heavily damaged Marina District of San Francisco, but its effects were also seen in the East Bay, and near the shore of Monterey Bay, where a non-destructive tsunami was also observed. Due to the sports coverage of the 1989 World Series, it became the first major earthquake in the United States that was broadcast live on national television (and as a result is sometimes referred to as the "World Series earthquake"). Rush-hour traffic on the Bay Area freeways was lighter than normal because the game, being played at Candlestick Park in San Francisco, was about to begin, and this may have prevented a larger loss of life, as several of the Bay Area's major transportation structures suffered catastrophic failures. The collapse of a section of the double-deck Nimitz Freeway in Oakland was the site of the largest number of casualties for the event, but the collapse of man-made structures and other related accidents contributed to casualties occurring in San Francisco, Los Altos, and Santa Cruz. The ML 5.3 June 1988 and the ML  5.4 August 1989 events also occurred on previously unknown oblique reverse faults and were within 3 mi (4.8 km) of the M6.9 Loma Prieta mainshock epicenter, near the intersection of the San Andreas and Sargent faults. Total displacement for these shocks was relatively small (approximately 4 in (100 mm) of strike-slip and substantially less reverse-slip) and although they occurred on separate faults and well before the mainshock, a group of seismologists considered these to be foreshocks due to their location in space and time relative to the main event. Each event's aftershock sequence and effect on stress drop was closely examined, and their study indicated that the shocks affected the mainshock's rupture process. Following the August 8, 1989, shock, in anticipation of an upcoming large earthquake, staff at the University of California, Santa Cruz deployed four accelerometers in the area, which were positioned at the UCSC campus, two residences in Santa Cruz, and a home in Los Gatos. Unlike other nearby (high gain) seismographs that were overwhelmed (driven off scale) by the large magnitude mainshock, the four accelerometers captured a useful record of the main event and more than half an hour of the early aftershock activity. The June 27, 1988, shock occurred with a maximum intensity of VI (Strong). Its effects included broken windows in Los Gatos, and other light damage in Holy City, where increased flow was observed at a water well. Farther away from the Santa Cruz Mountains, pieces of concrete fell from a parking structure at the Sunnyvale Town Center, a two-level shopping mall in Santa Clara County. More moderate damage resulted from the August 8, 1989, shock (intensity VII, Very strong) when chimneys were toppled in Cupertino, Los Gatos, and Redwood Estates. Other damage included cracked walls and foundations and broken underground pipes. At the office of the Los Gatos City Manager, a window that was cracked had also been broken in the earlier shock. Also in Los Gatos, one man died when he exited a building through a window and fell five stories. Fifty-seven of the deaths were directly caused by the earthquake; six further fatalities were ruled to have been caused indirectly. In addition, there were 3,757 injuries as a result of the earthquake, 400 of which were serious. 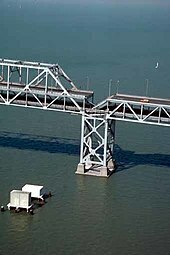 The highest number of fatalities, 42, occurred in Oakland because of the Cypress Street Viaduct collapse on the Nimitz Freeway (Interstate 880), where the upper level of a double-deck portion of the freeway collapsed, crushing the cars on the lower level, and causing crashes on the upper level. One 50-foot (15 m) section of the San Francisco–Oakland Bay Bridge also collapsed, leading to a single fatality, Anamafi Moala, a 23-year-old woman. Three people were killed in the collapse of buildings along the Pacific Garden Mall in Santa Cruz, and five people were killed in the collapse of a brick wall on Bluxome Street in San Francisco. When the earthquake hit, the third game of the 1989 World Series baseball championship was about to begin. Because of the unusual circumstance that both of the World Series teams (the San Francisco Giants and Oakland Athletics) were based in the affected area, many people had left work early or were staying late to participate in after work group viewings and parties. As a consequence the normally crowded freeways contained unusually light traffic. If traffic had been normal for a Tuesday rush hour, injuries and deaths would certainly have been higher. The initial media reports failed to take into account the game's effect on traffic and initially estimated the death toll at 300, a number that was corrected to 63 in the days after the earthquake. 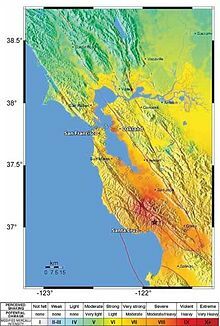 After the 1989 Loma Prieta earthquake occurred, a group led by Antony C. Fraser-Smith of Stanford University reported that the event was preceded by disturbances in background magnetic field noise as measured by a sensor placed in Corralitos, about 4.5 miles (7 km) from the epicenter. From October 5, they reported that a substantial increase in noise was measured in the frequency range 0.01–10 Hz. The measurement instrument was a single-axis search-coil magnetometer that was being used for low frequency research. Precursor increases of noise apparently started a few days before the earthquake, with noise in the range 0.01–0.5 Hz rising to exceptionally high levels about three hours before the earthquake. Though this pattern gave scientists new ideas for research into potential precursors to earthquakes, and the Fraser-Smith et al. report remains one of the most frequently cited examples of a specific earthquake precursor, more recent studies have cast doubt on the connection, attributing the Corralitos signals to either unrelated magnetic disturbance or, even more simply, to sensor-system malfunction. 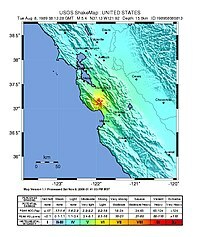 The earthquake caused severe damage in some very specific locations in the San Francisco Bay Area, most notably on unstable soil in San Francisco and Oakland. Oakland City Hall was evacuated after the earthquake until a US$80 million (equivalent to US$162 million today) seismic retrofit and hazard abatement work was completed in 1995. Many other communities sustained severe damage throughout the region located in Alameda, San Mateo, Santa Clara, San Benito, Santa Cruz and Monterey counties. Major property damage in San Francisco's Marina District 60 mi (97 km) from the epicenter resulted from liquefaction of soil used to create waterfront land. Other effects included sand volcanoes, landslides and ground ruptures. Some 12,000 homes and 2,600 businesses were damaged. In Santa Cruz, close to the epicenter, 40 buildings collapsed, killing six people. At the Santa Cruz Beach Boardwalk, the Plunge Building was significantly damaged. Liquefaction also caused damage in the Watsonville area. For example, sand volcanoes formed in a field near Pajaro as well as in a strawberry field. The Ford's department store in Watsonville experienced significant damage, including a crack down the front of the building. Many homes were dislodged if they were not bolted to their foundations. There were structural failures of twin bridges across Struve Slough near Watsonville. In Moss Landing, the liquefaction destroyed the causeway that carried the Moss Beach access road across a tidewater basin, damaged the approach and abutment of the bridge linking Moss Landing spit to the mainland and cracked the paved road on Paul's Island. In the Old Town historical district of the city of Salinas, unreinforced masonry buildings were partially destroyed. The quake caused an estimated $6 billion (equivalent to $13 billion today) in property damage, becoming one of the most expensive natural disasters in U.S. history at the time. Private donations poured into aid relief efforts and on October 26, President George H. W. Bush signed a $1.1 billion ($2.2 billion today) earthquake relief package for California. At the intersection of Beach and Divisadero Streets in San Francisco, a natural gas main rupture caused a major structure fire. The San Francisco Fire Department selected civilians to help run fire hoses from a distance because the nearby hydrant system failed. Since the bay was only two blocks from the burning buildings, water from the bay was pumped by the fireboat Phoenix, to engines on the shore, and from there sprayed on the fire. The apartment structures that collapsed were older buildings that included ground floor garages, which engineers refer to as a soft story building. The San Francisco–Oakland Bay Bridge suffered severe damage, as a 76-by-50-foot (23 m × 15 m) section of the upper deck on the eastern cantilever side fell onto the deck below. The quake caused the Oakland side of the bridge to shift 7 in (18 cm) to the east, and caused the bolts of one section to shear off, sending the 250-short-ton (230 t; 500,000 lb; 226,800 kg) section of roadbed crashing down like a trapdoor. Traffic on both decks came to a halt, blocked by the section of roadbed. Police began unsnarling the traffic jam, telling drivers to turn their cars around and drive back the way they had come. Eastbound drivers stuck on the lower deck between the collapse and Yerba Buena Island were routed up to the upper deck and westward back to San Francisco. A miscommunication made by emergency workers at Yerba Buena Island routed some drivers the wrong way; they were directed to the upper deck where they drove eastward toward the collapse site. One of these drivers did not see the open gap in time; the car plunged over the edge and smashed onto the collapsed roadbed. The driver, Anamafi Moala, died, and the passenger, her brother, was seriously injured. Caltrans removed and replaced the collapsed section, and re-opened the bridge on November 18. Built in the late 1950s and opened to traffic in 1957 (as SR 17), the Cypress Street Viaduct, a stretch of Interstate 880, was a double-deck freeway section made of nonductile reinforced concrete that was constructed above and astride Cypress Street in Oakland. Roughly half of the land the Cypress Viaduct was built on was filled marshland, and half was somewhat more stable alluvium. Because of new highway structure design guidelines—the requirement of ductile construction elements—instituted following the 1971 San Fernando earthquake, a limited degree of earthquake reinforcement was retrofitted to the Cypress Viaduct in 1977. The added elements were longitudinal restraints at transverse expansion joints in the box girder spans, but no studies were made of possible failure modes specific to the Cypress Viaduct. CalTrans has since received widespread criticism for not thoroughly studying the structure. When the earthquake hit, the shaking was amplified on the former marshland, and soil liquefaction occurred. During the earthquake, the freeway buckled and twisted before the support columns failed and the upper deck fell on the lower deck. 41 people were crushed to death in their cars. Cars on the upper deck were tossed around violently, some of them flipped sideways and some of them were left dangling at the edge of the freeway. Nearby residents and factory workers came to the rescue, climbing onto the wreckage with ladders and forklifts and pulling trapped people out of their cars from under a four-foot gap in some sections. 60 members of Oakland's Public Works Agency left the nearby city yard and joined rescue efforts. Employees from Pacific Pipe drove heavy lift equipment to the scene and started using it to raise sections of fallen freeway enough to allow further rescue. Local workers continued their volunteer operation nonstop until October 21, 1989, when they were forced to pause as U.S. President George H. W. Bush and California Governor George Deukmejian viewed the damage. On October 21, survivor Buck Helm was freed from the wreckage, having spent 90 hours trapped in his car. Dubbed "Lucky Buck" by the local radio, Helm lived for another 29 days on life support, but then died of respiratory failure at the age of 57. Although the freeway reopened in stages between 1997 and 1999, it was not fully rebuilt until 2001 due to safety and reinforcement concerns. In the meantime, traffic was detoured through nearby Interstate 980, causing increased congestion. 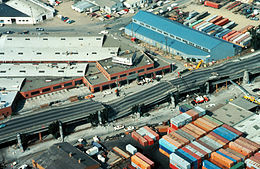 Instead of rebuilding Interstate 880 over the same ground, Caltrans rerouted the freeway farther west around the outskirts of West Oakland to provide better access to the Port of Oakland and the San Francisco–Oakland Bay Bridge, and to meet community desires to keep the freeway from cutting through residential areas (at the time the original viaduct was constructed, West Oakland was predominantly occupied by African and Hispanic-Americans). Street-level Mandela Parkway now occupies the previous roadbed of the Cypress structure. Immediately after the earthquake, San Francisco Bay Area airports were closed so officials could conduct visual inspection and damage assessment procedures. San Jose International Airport, Oakland International Airport and San Francisco International Airport all opened the next morning. Large cracks in Oakland's runway and taxiway reduced the usable length to two-thirds normal, and damage to the dike required quick remediation to avoid flooding the runway with water from the bay. Oakland Airport repair costs were assessed at $30 million (equivalent to $64 million today). San Francisco Municipal Railway (Muni) lost all power to electric transit systems when the quake hit, but otherwise suffered little damage and no injuries to operators or riders. Cable cars and electric trains and buses were stalled in place—half of Muni's transport capability was lost for 12 hours. Muni relied on diesel buses to continue abbreviated service until electric power was restored later that night, and electric units could be inspected and readied for service on the morning of October 18. After 78 hours, 96 percent of Muni services were back in operation, including the cable cars. Amtrak intercity rail service into Oakland from the California Zephyr continued, but the Coast Starlight was temporarily suspended north of Salinas because of damage to the Southern Pacific's Coast Line. The earthquake changed the Bay Area's automobile transportation landscape. Not only did the quake force seismic retrofitting of all San Francisco Bay Area bridges, it caused enough damage that some parts of the region's freeway system had to be demolished. Damage to the region's transportation system was estimated at $1.8 billion (equivalent to $3.6 billion today). Cypress Street Viaduct/Nimitz Freeway, Interstate 880: The 1.78-mile (2.86 km) double-decked Cypress Street Viaduct, Interstate 880 was demolished soon after the earthquake, and was not replaced until July 1997 (To the Bay Bridge only, the ramps to and from Interstate 80 east were not completed until 2001 despite opening in 1999). The replacement freeway section is a single-deck rather than double-deck structure and was re-routed around the outskirts of West Oakland, rather than bisecting it as the Cypress Street Viaduct had done. The former route of the Cypress Street Viaduct was reopened as the ground-level Mandela Parkway. State Route 17: Over half of the 26-mile (42 km) highway was closed for about one to two months because of landslide that occurred between Granite Creek Road in Scotts Valley and State Route 9 in Los Gatos. The route crosses the San Andreas Fault in the Santa Cruz Mountains, near the earthquake's epicenter. West Valley Freeway, State Route 85: Ironically, State Route 85 went undamaged while under construction in Santa Clara County despite being the same distance from the epicenter as SR 17. The freeway would eventually be completed and fully opened in October 1994, approximately five years after the earthquake. The 5.7 mile northern segment that opened in December 1965 was also spared major damage. Cabrillo Highway, State Route 1: In Watsonville, the Struve Slough Bridge collapsed, with concrete/steel support columns penetrating up through the bridge deck. The highway was closed for several months until it could be demolished and rebuilt (commuters took SR 152 and SR 129 as bypass routes). Another section of Highway 1 through Monterey suffered damage and had to be rebuilt as well. Additionally, the bridge carrying Highway 1 over the Salinas River near Fort Ord was damaged and subsequently rebuilt. Bay Area Rapid Transit: The BART rail system, which hauled commuters between the East Bay and San Francisco via the Transbay Tube, was virtually undamaged and only closed for post-earthquake inspection. With the Bay Bridge closed because of its damage, the Transbay Tube became the quickest way into San Francisco via Oakland for a month, and ridership increased in the three work weeks following the earthquake, going from 218,000 riders per average weekday to more than 330,000 post-quake, a 50% increase. BART instituted round-the-clock train service until December 3 when they returned to their normal schedule. In 2006, BART began the $1.3 billion Earthquake Safety Program to retrofit tunnels, aerial structures, and stations, with completion planned by 2022. The network put up a green ABC Sports graphic while it scrambled to repair the video feed (the broadcast cameras and mics were powered by the local power supply), but audio from the stadium was restored after a few seconds via a telephone link. Michaels cracked, "Well, folks, that's the greatest open in the history of television, bar none!" accompanied by the combined screams of excitement and panic from fans who had no idea of the devastation elsewhere. ABC then switched to an episode of Roseanne which was on standby for a rain delay situation, while attempting to restore electricity to its remote equipment. With anchorman Ted Koppel in position in Washington, D.C., ABC News began continuous coverage of the quake at about 17:40 PDT, at the same time as CBS News; Al Michaels, in the process, became a de facto on-site reporter for ABC. NBC News also began continuous coverage, with Tom Brokaw, about an hour later. The Goodyear blimp had already been overhead to cover the baseball game, and ABC used it to capture images of damage to the Bay Bridge and other locations. The October 18, 1989 edition of NBC's Today that covered the earthquake ran until noon Eastern Time. Bryant Gumbel, Jane Pauley and Deborah Norville anchored from Chicago (where they had planned to originally do a special celebratory edition), with reports done by Bob Jamieson and Don Oliver in San Francisco, and George Lewis in Oakland. Jim Miklasewski and Bob Hager covered disaster response from Washington. NBC Sports commentators Bob Costas and Jimmy Cefalo discussed the effect the temblor would have on the 1989 World Series. It is likely that the World Series game saved many lives, as Bay Area residents who would have normally been on the freeways were at home ready to watch the game when the earthquake hit. It is a rough estimate that thousands of people may have otherwise been on the Cypress Structure during the 5:00 p.m. rush-hour, as the structure was said to have carried 195,000 vehicles a day. The events in the TV sitcom Full House episode "Aftershocks" (December 8, 1989) take place following the Loma Prieta earthquake; it centers on Stephanie Tanner having a hard time telling her father Danny about how she fears another aftershock might happen and kill him (since he is a widowed single father) as well as other members of the family. The San Francisco-based punk music group Loma Prieta derived their name from the 1989 earthquake. The 2004 video game Grand Theft Auto: San Andreas (Rockstar) takes place in 1992. In it, fictional San Fierro, the game's version of San Francisco, has a few quake-damaged areas courtesy of a major shaker occurring three years before the game begins. One location includes a damaged overpass resembling the collapsed Cypress Street Viaduct. The earthquake was one of the events that was "predicted" in the TV series Back to 1989, a 2016 Taiwanese time-travelling drama, where protagonist Chen Che accidentally traveled from 2016 to the year before he was born (more precisely, a month before he was conceived) in 1989 to find out about his birth father, the reasons that led to his mother's personality change, and "predict" the number of days it would take for this earthquake's survivors to be found. ^ ANSS: Loma Prieta 1989, Origin (as of 2019-04-01). ^ Times Wire Services (August 8, 1989). "1 Dead as 5.1 Quake Jolts Bay Area : Man, 19, Leaps to Death in Panic; Damage Minor". Los Angeles Times. ^ Eberhart-Phillips JE; Saunders TM; Robinson AL; Hatch DL; Parrish RG (June 1994). "Profile of mortality from the 1989 Loma Prieta earthquake using coroner and medical examiner reports". Disasters. 18 (2): 160–70. doi:10.1111/j.1467-7717.1994.tb00298.x. PMID 8076160. ^ a b c USGS. San Andreas Fault, chapter 1, p. 5. "Comparison of the Bay Area Earthquakes: 1906 and 1989." Retrieved August 31, 2009. ^ Palm, 1992, p. 63. ^ Windmiller, Joel. "Cypress Viaduct Freeway". Archived from the original on July 7, 2009. Retrieved August 29, 2009. ^ a b c d e Fagan, Kevin (October 12, 1999). "Out of the Rubble. Ten Years After: First in a week-long retrospective of the Loma Prieta quake". San Francisco Chronicle. ^ a b Hager, Philip (May 1, 1991). "Claim Settled in the Only Quake Death, Injury on Bay Bridge". Los Angeles Times. Retrieved February 21, 2014. ^ "1989: Earthquake hits San Francisco". BBC News. October 17, 1989. Retrieved August 29, 2009. ^ a b c d Fraser-Smith, Antony C.; Bernardi, A.; McGill, P. R.; Ladd, M. E.; Helliwell, R. A.; Villard, Jr., O. G. (August 1990). "Low-Frequency Magnetic Field Measurements Near the Epicenter of the Ms 7.1 Loma Prieta Earthquake" (PDF). Geophysical Research Letters. 17 (9): 1465–1468. Bibcode:1990GeoRL..17.1465F. doi:10.1029/GL017i009p01465. ISSN 0094-8276. OCLC 1795290. Retrieved December 18, 2010. ^ Campbell, W. H. (2009). "Natural magnetic disturbance fields, not precursors, preceding the Loma Prieta earthquake". Journal of Geophysical Research. 114 (A5): A05307. Bibcode:2009JGRA..114.5307C. doi:10.1029/2008JA013932. ^ a b "Earthquake". Time. Monday, October 30, 1989. Ed Magnuson. p. 5. Retrieved September 5, 2009. ^ a b c Gathright, Alan (October 16, 2004). "Loma Prieta Earthquake: 15 years later. Shaken—and then stirred. Santa Cruz capitalized on fate, working together to rebuild downtown after quake". San Francisco Chronicle. ^ "Press – Boardwalk History". Beachboardwalk.com. Archived from the original on November 5, 2011. Retrieved December 31, 2011. ^ a b c d e "Watsonville Area". Pubs.usgs.gov. Retrieved December 31, 2011. ^ "Moss Landing". Pubs.usgs.gov. Retrieved December 31, 2011. ^ "Salinas". Pubs.usgs.gov. Retrieved December 31, 2011. ^ a b c d Rapaport, Richard J. (1998). The Media: Radio, Television, and Newspapers. The Loma Prieta, California, Earthquake of October 17, 1989—Lifelines: Performance of the Built Environment. U.S. Geological Survey Professional Paper. p. A43–A46. Retrieved February 28, 2013. ^ a b c Gerard, Jeremy. The New York Times, October 24, 1989. "The California Quake; NBC News Tells of Errors and Obstacles to Early Coverage of Quake". Retrieved September 11, 2009. ^ "Bay Area Television News Prepares For End Of An Era". May 12, 2008. Archived from the original on December 11, 2013. Retrieved March 1, 2013. ^ "KTVU comes back on-air after 1989 earthquake". ^ San Francisco Earthquake History 1990–1994. Archived November 5, 2012, at the Wayback Machine Retrieved September 11, 2009. ^ Fradkin, 1999, p. 188. ^ Fradkin, 1999, pp. 138, 193–194. ^ a b c d San Francisco Earthquake History 1915–1989. Archived March 4, 2016, at the Wayback Machine Retrieved August 29, 2009. ^ a b An Oral History of the Presidio of San Francisco During the Loma Prieta Earthquake Retrieved August 29, 2009. ^ "Earthquake". Time. Monday, October 30, 1989. Ed Magnuson. p. 1. Retrieved September 5, 2009. ^ a b Scawthorn; Eidinger; Schiff, eds. (2005). Fire Following Earthquake. Reston, VA: ASCE, NFPA. ISBN 9780784407394. ^ Guardians of the City. Fire Department. "SFFD Fireboats: The History of the Fireboat Phoenix." Retrieved August 29, 2009. ^ "Fireboats: Then and Now". FEMA. Technical Report Series. Special Report. USFA-TR-146/May 2003. Retrieved August 29, 2009. ^ "Putting Down Roots in Earthquake Country". Retrieved August 29, 2009. ^ a b "Buildings Demolished in Downtown Santa Cruz as a Result of the Loma Prieta Earthquake, 1989". Santa Cruz Public Libraries. Local History. Retrieved August 29, 2009. ^ a b c d Santa Cruz Public Libraries. Local History. Log of Emergency Response Operations. Tuesday, October 17, 5:04PM, 15-second earthquake! Retrieved August 29, 2009. ^ Santa Cruz Public Libraries. Local History. Photograph Collection: rs009. The front of Ford's Department Store on the corner of Pacific Avenue and Cathcart Street. A woman inside the store died from falling debris during the earthquake. Ford's was later razed. Date: October 18, 1989. Courtesy of Ray Sherrod. Retrieved August 29, 2009. ^ a b c d sfmuseum.org. Edward J. Phipps. Overview of Fire Service Responses near the Epicenter of the Loma Prieta Earthquake Retrieved August 29, 2009. ^ "Earthquake". Time. Monday, October 30, 1989. Ed Magnuson. p. 6. Retrieved August 29, 2009. ^ a b "Earthquake". Time. Monday, October 30, 1989. Ed Magnuson. p. 2. Retrieved September 5, 2009. ^ a b c d USGS. Historic Earthquakes. Santa Cruz Mountains (Loma Prieta), California. Archived September 22, 2008, at the Wayback Machine Retrieved September 6, 2009. ^ Cheevers, Jack (October 25, 1989). "Bay Area Quake—Landmarks Totter—Preservationists Fear Quake-Damaged Historic Buildings Will Be Torn Down". Los Angeles Times. ^ Viets, Jack (October 27, 1989). "They Drove Into Gap: Survivor Recalls Death Of Sister on Bay Bridge". San Francisco Chronicle. The Chronicle Publishing Co. p. A21. ^ a b Fowler, Dave. The Initial Response to the Cypress Freeway Disaster. Retrieved September 5, 2009. ^ Fagan, Kevin (October 12, 1999). "On the Cypress Freeway, Strangers Joined Together for a Snap in Time". San Francisco Chronicle. ^ EERI, November 1989. Loma Prieta Earthquake, October 17, 1989. Preliminary Reconnaissance Report. Retrieved September 6, 2009. ^ "People Moving Gingerly As They Pick Up Pieces". The New York Times. October 21, 1989. Retrieved August 29, 2009. ^ "Survivor Pulled From Cypress Carnage, Miracle in the Ruins: Buck Helm is 'Tough as Nails.'". San Francisco Examiner. October 22, 1989. p. A1. ^ "Man Who Lived 90 Hours In Quake Rubble Is Dead". The New York Times. Associated Press. November 20, 1989. ^ a b Caltrans. 1998 Highway Congestion Monitoring Report. Retrieved September 20, 2009. ^ "Earthquake". Time. Monday, October 30, 1989. Ed Magnuson. p. 7. Retrieved September 5, 2009. ^ Roderick, Kevin (October 19, 1989). "Search For Bodies to Take Days—State Puts Toll at 273, Then Says It Is Uncertain". Los Angeles Times. ^ a b c Stead, William G., Muni Railway Manager. "Municipal Railway Earthquake Notebook Tuesday, October 17, 1989, 5:04 PM", December 15, 1989, letter to Art Agnos, mayor. Retrieved September 5, 2009. ^ Egelko, Bob (October 18, 1989). "Earthquake leaves behind urban travel nightmares". Nashua Telegraph. ^ Golden Gate Bridge. Overview of Golden Gate Bridge Seismic Retrofit. Updated February 2009. Retrieved September 20, 2009. ^ San Francisco-Oakland bay bridge opens to traffic after years of delays | World news. theguardian.com. Retrieved on 2013-09-06. ^ SFGate.com. Demolition Of I-280 Stub Starts Saturday: China Basin area work to last for 2 months. August 8, 1995. Retrieved October 17, 2009. ^ SFGate.com. Interchange Between Highway 280, 101 Reopens. December 4, 1995. Retrieved October 17, 2009. ^ SFGate.com. Major Bay Area Highway Projects. February 23, 1997. Retrieved October 17, 2009. ^ "Earthquake Safety Program". Bay Area Rapid Transit. Retrieved January 9, 2016. ^ National Association of Railroad Passengers (August 19, 1994). "Hotline #839". Archived from the original on October 4, 2013. Retrieved July 31, 2012. ^ Cabanatuan, Michael (April 13, 2006). "BAY AREA / Revived push for water-transit network / Emergency system seen as necessary after a big quake". San Francisco Chronicle. Retrieved January 9, 2016. ^ News report on MLB.COM, 1:50 minutes in. Retrieved August 29, 2009. ^ "Earthquake". Time. Monday, October 30, 1989. Ed Magnuson. p. 3. Retrieved September 5, 2009. ^ a b c Hinshaw, Horace. Pacifica Tribune, June 17, 2009. "Remembering World Series Earthquake." Hosted by MercuryNews.com. Retrieved August 30, 2009. ^ Schwartz, Bob (October 20, 1989). "THE BAY AREA QUAKE : Pressure Points : WHAT WORKED, WHAT DIDN'T, AND WHY : NIMITZ FREEWAY : Collapse of Deck Puts Spotlight on Aging Roads". Los Angeles Times. Retrieved January 19, 2017. ^ Joan Hanauer, UPI (December 7, 1989). "'Full House' Episode to Deal With Earthquake Trauma". Los Angeles Times. ^ Sarah Gilbert (October 18, 2005). "Medium: Sweet Dreams". TV Squad. Archived from the original on February 5, 2013. ^ Cecil (November 19, 2009). "Fringe: August". TV Fodder. Retrieved May 7, 2010. ^ Trager, Oliver (1997). The American Book of the Dead. Simon and Schuster. p. 54. ISBN 978-0-684-81402-5. ^ Todd Kennedy Hitting the American Highway: The Ontology of the Hobo-hero – 2007 "...she also utilizes Dylan's rain imagery as blinding when she says, "Oh the weather and a blinding hail / We were riding high 'til the '89 quake / Hit the Santa Cruz garden mall / Like a Wrecking Ball... p.180"
ANSS, "Loma Prieta 1989", Comprehensive Catalog, U.S. Geological Survey . This page was last edited on 24 April 2019, at 18:47 (UTC).